This well maintained and improved Bayliner Trophy 2902 Walkaround is a testament to the owner. The hull was launched in 1999 with pre-owned 2006 Verados (1300hrs) installed in 2017, brand new legs, gearboxes and stainless steel props were fitted to the Verados at the time of installation. The owner still has the original Mercury Optimax engines (available by negotiation), with a mere 200 hours on the clock. The hull has now done just 800 hours in its life. A vast array of impressive electronics upgrades have been added to bring this Trophy up to present-day standards. These include new Raymarine 7 Hybridtouch 12" screen, Lowrance Elite 7TI sounder and GPS, solar panel with regulator, new batteries and switch panel, deck wash pump, anchor winch, Fusion stereo, toilet, instrument panel, LED lighting throughout and much more. An inspection is a must, you will be highly impressed with the amount of deck and cabin space for a 29' monohull. 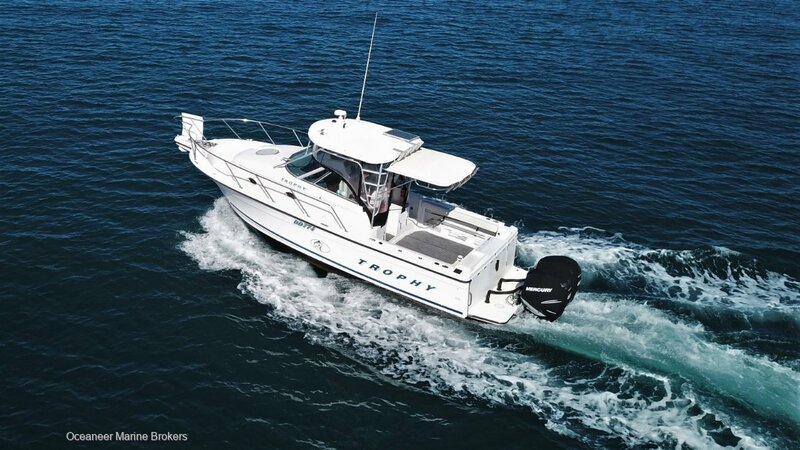 This is the perfect coastal fishing boat with the ability to sleep 4 and be a comfortable overnighter at Rottnest. For a full list of specifications and upgrades please don't hesitate to contact Matt or Tom Lovelady. We are ready to show any interested purchaser through this impressive vessel, simply ask! Pen at Port Coogee included in the sale by negotiation. accomodationForward double with drop down dinette table, aft double under cockpit floor.